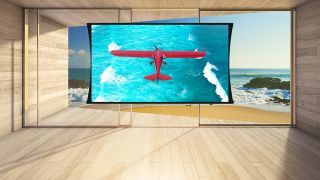 The What: Screen Innovations (SI) is now shipping the Zero-G, a new motorized projection screen that is designed to give the appearance of floating in midair, and can roll out of the way when not in use. The What Else: Zero-G was created to allow customers to watch a game or movie on an image that “levitates” in a space on cables that can be color-matched to one of several proprietary color options in order to be as unobtrusive as possible. When matched to their surrounding wall or background color, these cords become nearly invisible in the space, creating the illusion of a levitating screen. “Zero-G has created a lot of buzz in the industry, and many competitors are already taking pictures of it at our trade shows, trying to figure it out,” said Ryan Gustafson, chief innovator of SI. “We are pleased to announce that Zero-G—the world’s first Rollable TV—is now shipping worldwide. “We have heard from so many people that they had to completely alter the natural orientation of their room because there was only one place they could mount a television,” said Blake Vackar, director of commercial sales at SI. “Even motorized screens can sometimes be a visual nuisance with a large ‘black-drop’ connecting the viewing surface to the case. Since Zero-G is suspended by cables, it can be placed anywhere in a room, even in front of a bay of windows or an art-deco wall. SI has included an array of features that makes Zero-G easier to install and set up, such as removable PCB, upper lift tubes, and factory pre-programmed bomb-bay doors on its flush model. SI has also engineered an automatic upper-limit setting by using an optical sensor, and will also optionally ship the material tube separate from the case for new construction installations. The Bottom Line: Zero-G screens are available up to a maximum size of 160 inches diagonally in a 16:9 aspect ratio, and feature a choice of SI’s ambient light-rejecting Slate material of Pure white or gray materials.